One of the many things you learn playing baseball – perhaps playing any sport – is to accept what is out of your control. Sometimes the ball has eyes and finds the gap. Sometimes you hit into a double play with the bases loaded. I went 0-fo-5 yesterday after a good game at the plate on Opening Day. But believe me when I tell you there was no difference – meaning that I wasn’t “on” one day and “off” the next. I felt good last night. I hit the ball well. Some days it goes right at people. Some days it gets through. That’s baseball. A few inches one way or the other, and it’s a different game. Randy Johnson’s pitch to Gallardo last night, for example. We wanted a fastball higher than the letters on his chest so he would chase it for the third strike. The ball wasn’t as high as it needed to be. That kid is a good hitter, too, don’t forget. But if the pitch is just a little bit higher, we get him. This game so often comes down to the slightest of margins, the tiniest bits of bad luck. To tell you the truth, I never thought we were out of it last night. I always expected we’d come back. But we’re going to have many more chances, so you can’t dwell on what didn’t work for us last night. You have to just get ready for today’s game. As for Tim on Opening Day, I was thinking he might have a tough day even when we were warming up in the bullpen. When he walked the first batter and hit the third, I went out to talk to him. I’m not going to tell him anything about mechanics, of course. He didn’t have command of his fastball or his curveball. Usually if one isn’t working, he has the other. But people have to remember this kid is a human being. He’s not a machine. I admired how he kept fighting out there. That’s one of the beautiful things about baseball. The days when you really aren’t at the top of your game are the days when you test yourself the most. Those are the days you earn your money. And afterward I told Tim that sometimes you need to struggle to come back stronger. You have to keep it all in perspective, too, which is tougher when you’re young. There are way more important things to worry about than giving up some walks or going 0-for-5. Today was the worst kind of reminder of that. I keep thinking about Nick Adenhart, the young Angels pitcher killed by a drunk driver last night. It’s the kind of news that gives you the chills. Makes you shake. We’re playing a game, but once those lights go out in the ballpark, it’s real life out there. I keep thinking how you can be doing everything 100 percent right, but some other guy right next to you isn’t doing the right thing and you pay the price. I keep thinking that if Adenhart’s car had entered the intersection two seconds earlier or two seconds later, maybe he goes home thinking about his next start. The slightest of margins, the tiniest bits of bad luck. Another really tough loss today. Matt Cain had a no-hitter going into the fifth and we ended up losing, 13-8. Five losses in a row at home, and now we’re off to Colorado, Florida and Arizona for nine games on the road. We’re very, very frustrated with what we’ve done so far as a team, I can tell you that. There were times during this homestand that I could hardly move from my locker after a game. I always try to talk to reporters because when I talk to them, I know I’m talking to the fans. But sometimes I take the losses so hard, I can’t talk to anybody. I know other guys feel the same way. You always feel, if you didn’t come through when you’re needed to, that you let all your teammates down. And you let the fans down. That’s the worst feeling. Still, you know you have to put it behind you. You have to keep fighting. That’s the only way. You don’t make it very far in baseball if you can’t battle through tough times. There is so much failure in this game that it’s easy to get beaten down by it. The ones who DON’T let it crush them are the ones who survive at the Major League level. And believe me when I tell you that this is a team not just of survivors, but of warriors. When we get to the ballpark in Colorado, we’ll put a fence around this awful loss and be ready to go 150 percent. Part of what I do to get ready at the start of each series is to study the inch-and-a-half-thick scouting report on our opponent. Right now, I’m on the plane from San Francisco to Denver and going through the reports on each batter for the Rockies: How have they been swinging lately? What percentage of the time do they swing at curve balls, sliders, fastballs? What do they want when they get one strike? Two strikes? How do they run? Steve Holm is sitting in the row in front of me, and he’s going through the same stack of papers. We talk about the hitters and get an idea on how to pitch to each one, how to get each one out. At the ballpark, we’ll watch videos of the Rockies’ last few games with Dave Righetti and Mark Gardner, the pitching coach and bullpen coach. Those two guys are very, very prepared for every team. It’s amazing how much homework they do. So we go over the lineup together and come up with a plan for every batter. Of course, once the game starts, what we prepared for and what actually happens could be totally different things. A batter might not do anything that the scouting report said he would. So Holmy and I have to be ready to adjust. Between innings, we’ll consult with each other and with Righetti about the next three guys in the order. Sometimes, in the dugout, I’ll look at the scouting report again to refresh my memory about a particular guy. Then, after all the hours of preparation, it’s up to the pitcher to make the pitch. Two real positives of this homestand were Omar Vizquel’s return from the disabled list and Tim Lincecum’s continued great pitching. Omar is always so motivated and happy that he lifts everyone up. We feel pretty secure when he’s out on the field. Not taking anything away from the younger guys, but Omar is a veteran, a future Hall of Famer, and when he’s out there, we all feel pretty good. People have been asking me what makes Lincecum special. The first thing I say is he has a great heart. He’s not afraid of anything. He’s not afraid of getting hit. His skills, of course, are amazing: He throws over 95 mph, has a great changeup, a great slider and curve. But what makes him so good, at least in great part, is that he believes no one can hit him. Sometimes pitchers give too much respect to batters. But Lincecum always seems to believe that no matter how great the batter’s reputation, he’s better, and he’s going to get him out. OK, I should get back to studying this scouting report. Thanks for checking in. I’ll try to write more often. But I admit, when we lose, I’m not very eager to share my thoughts. 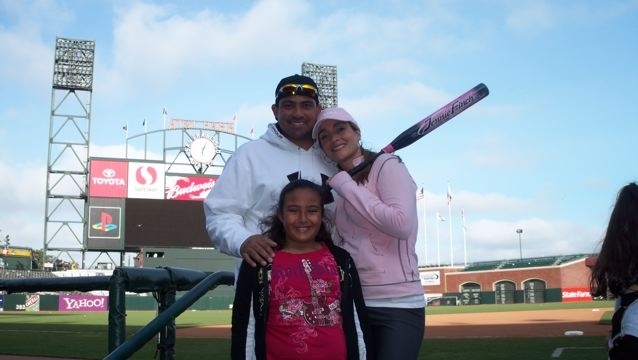 And during homestands, I’m trying to spend as much time with my family as I can, so I run out of time for anything but family and baseball. I took my younger daughter to the Exploratorium on Saturday and had a great time. What an amazing place. She thought it was awesome. 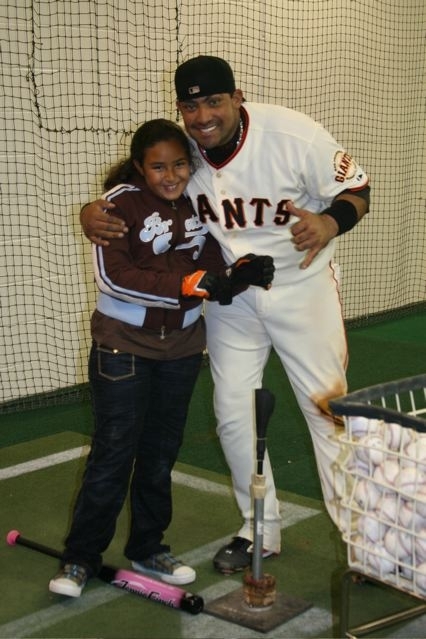 Then after the game Saturday night, I took her into the batting cage behind the dugout and tossed balls to her. I was still in my uniform and dog-tired. But she was so happy that we stayed until about 11. She flew back today to Yuma, where she lives with her mother. The toughest part of any homestand, besides letting go of the losses, is saying good-bye.